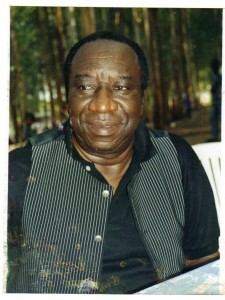 Legendary Congolese singer/composer and band leader Tabu Ley Rochereau has passed on today (November 30 2913). He died at St. Luke’s Hospital in Brussels Belgium Hospital where he was undergoing treatment for a stroke that he had suffered in 2008, but had often been affecting his health. Tabu Ley never fully recovered from the stroke and it limited his activities, leaving him mostly bedridden. “I feel very well as you can notice. As per my doctors, my health conditions are improving every day. The thing is that I have to accept my current condition with good-naturedness. I am 72 years old and find it normal to face some physical weaknesses. I am a Christian and trust in God,” said Tabu Ley when asked about his health recently. Tabu Ley is generally considered one of the greatest musicians ever to emerge from Africa. In Congolse music circles, he is considered second only to another legend, Franco Luambo Makiadi. Tabu Ley had been an inspiration to many of today’s singers, most notably Koffi Olomide who was inspired by Tabu Ley especially in his early years. 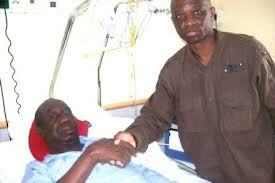 His career started in 1959 under Grand Kalle (Joseph Kabaselleh), the pioneer of modern Congolse music. There Tabu Ley played alongside another legend, Docteur Nico Kasanda, the father of modern Congolese guitar. He and Dr Nico left to form Africa Fiesta where they were joined by a young Josky Kiambukuta. Nico and Tabu Ley split with Tabu Ley forming Afrisa International, the band he would lead until he retired from music in 2006. Afrisa was one of the greatest bands throughout the 1970s and 1980s and competed with arch rivals TPOK Jazz of Franco. Afrisa alumni include the late Ndombe Opetum, Mavatiku Visi “Michelino”, Kiesse Diambu, Dino Vangu and of course Mbilia Bel who was once Tabu Ley’s wife. When Grand Kalle died in 1983, Tabu Ley composed a song which he sung alonsgide Franco. The song “Kabaselleh in memoriam” was one of the four songs in the Lisanga ya Banganga album. In the song, Tabu Ley credited Kabaselleh with being his mentor and said he would never be able to repay the debt he owes to Kabaselleh for giving his first opportunity in music. Throughout the 1970s and 1980s and into the 1990s, Tabu Ley’s hit songs were very popular on radio and in record sales. There were songs like Sorozo, Fololo ya Gansia, Tu as dique, Muzina. But none was bigger than the song “Maze” which was such a hit in Nairobi that the word “Maze” became part of the sheng language (the slang version of Swahili). In the early 1990s he was forced into exile after he criticised then president Mobutu Sese Seko. While in exile he released the album Exil Ley in which he indirectly criticised Mobutu by hailing past Congolese leaders like Lumumba whom Mobutu had betrayed to the Belgians and the CIA. On returning from Belgium, Tabu Ley served as Vice Governor of Bas Zaire, the province that surrounds Kinshasa. His last album was tempelo which was released in 2006. 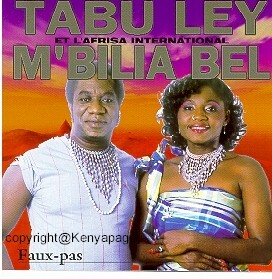 At age 73, it is fair to say that Tabu Ley lived a full life and we did indeed see the best of his music. May his soul rest in peace. This entry was posted in Africa Music News, Articles about Tabu Ley and tagged African Musicians, Tabu Ley. Bookmark the permalink.